Reader’s Favorite recognizes “Follow the Light, the Shroud’s Revelations” By T. C. Newman, in its 2015 international book award contest. The 2015 Readers’ Favorite International Book Award Contest- featured thousands of contestants from over a dozen countries. Readers’ Favorite has become the fastest growing book review and award contest site on the Internet. They have earned the respect of renowned publishers like Random House, Simon & Schuster, and Harper Collins, and have received the “Best Websites for Authors” and “Honoring Excellence” awards from the Association of Independent Authors. They are also very proud to be fully accredited by the BBB (A+ rating), which is a rarity among Book Review and Book Award Contest companies. 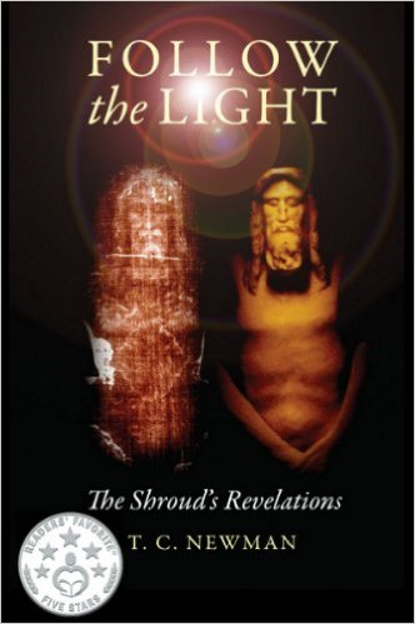 "Follow the Light, the Shroud’s Revelations" First published, February 11, 2013 by Outskirts Press. Is a fascinating account of the writer’s path to solve a mystery. It is an in depth study, self-motivated and discovered through exploration. It is scientifically sound based on a solid understanding of light and energy. T. C. Newman spent over 30 years studying the Shroud image to develop a better understanding of the Shroud of Turin. She is a self taught artist who’s dedicated diligence led to a better understanding of the Shroud’s image. Available worldwide on book retailer websites such as Amazon and Barnes & Noble. Outskirts Press, Best Book of the Year Finalist, 2013. "Follow the Light, the Shroud’s Revelations"